Every issue, we invite one member of the college community to share their delight in an object found on campus. Here, the Rev. Andrew Ciferni ’64, director of the Center for Norbertine Studies, speaks to the Norbert of Xanten Window that hangs just inside the entrance to the center. This window dates from 1918, and was made for a Dutch parish in Chicago, St. Willibrord’s, that had been Norbertine since 1900. 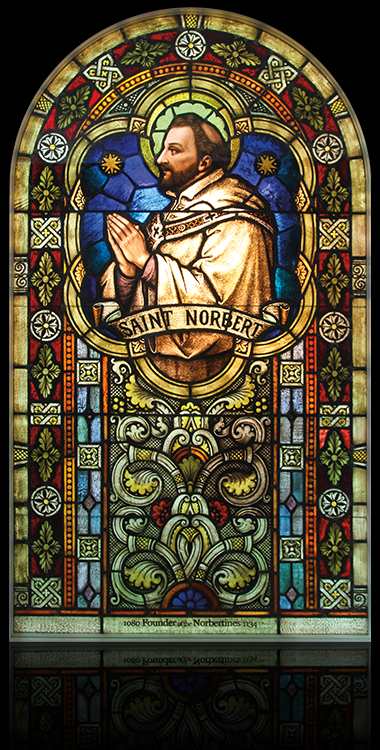 It was made by Emil Frei – the company that would eventually make the windows for St. Norbert Abbey. Theirs really is some of the finest stained glass made in the United States. After the church closed, the college purchased this piece. There is this sense of its coming home; it had to be brought back. So I’m fond of our window, because it carries a history. And, it’s part of what lets people know what the center is about. One of the first things I ask is, is this image historically correct? For example, Norbert would never have been wearing his archiepiscopal pallium over his habit like this. The pallium would only have been worn over a chasuble or a cope for major liturgies. But I do love the medieval framing, and this mixture of Celtic knots and stylized foliage. A window this size must have been up high in its church. But here in the center, you can confront it face-to-face. Ada Mae Crowley Pennington loves this window. [Ada Mae is the 7-year-old daughter of Karlyn Crowley (English, CVC) and John Pennington (English).] St. Norbert has become her friend. When she comes to the library, she visits him here. The Rev. Andrew Ciferni ’64 will shortly be returning to his home of Daylesford Abbey in Paoli, Pa., as director of liturgy. 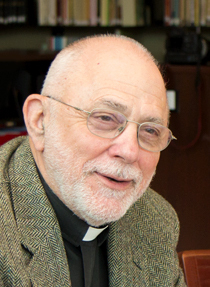 Ciferni is a founding member of the North American Academy of Liturgy and chairs the Norbertine order’s Commisssion for Lay Associates. He is the founding advisor of the St. Norbert College Spikeball Club.